Need to translate documents into German or English, be it commercial documents, business communication or marketing materials? Look no further, Systran's translation software can provide accurate and rapid translations, regardless the size of your files. 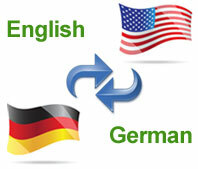 Need your German document translation in a hurry? 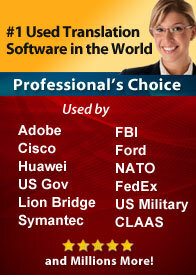 Use the software to convert small to very large PDF, Word or PowerPoint files instantly. To convert documents in your favorite formats, all you need to do is open them in the software and click "Translate". Apart from full text and document translation, Systran's translator is also able to keep formatting intact. This is one less thing to worry about, especially if your presentations or marketing materials include many images, charts and graphic elements. 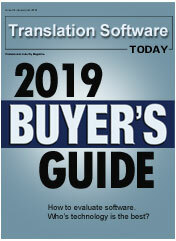 Not only does Systran stand for excellence in translation software development but its translation engine is unique, which means no other software has the same cutting-edge tools and features. Below you can find out more about the different types of files you can translate with Systran. Word Documents - Translate full German documents directly from Word with just one click of your mouse. Excel Documents - Convert Excel spreadsheets in a matter of seconds and preserve formatting. PowerPoint Presentations - Save hours of work translating complete presentations to and from German. Large PDF Files - Finally a solution that can convert those big PDF files while also retaining formatting. Email Communication - Easily exchange emails in German with business associates and customers. HTML Web Pages - Convert individual web pages or entire sites while preserving the links and tags. There is a closer relationship between German spelling and pronunciation than there is in English. The German language is very different from English in the fact that German makes extensive use of inflectional endings. The verb is inflected to show person, number, tense, and mood; and the subjunctive is frequently used. The declensional scheme has four cases: nominative, genitive, dative, and accusative. There are two ways of declining the adjective, and there are three grammatical genders: masculine, feminine, and neuter. Confused yet? Don't worry, software will handle the translation for you but understanding a little about the basics can come in handy when you're building your custom German dictionaries to increase accuracy.. When using translation software to translate full German documents you will notice a difference in word order. You will find that the it has very long compound words, in fact some words can be as long as a short sentence in English. On average, when you convert a document from English to German, you will see the amount of text will expand between 5 to 20%. When going the other direction, German to English, you will see the text contracts 5 to 40%. Even if a document retains the formatting, this means the layout can still be affected by moving one page into two, or vice versa. You will also notice that German is the only language in which all nouns are capitalized, common as well as proper. If you are working with English, normally proper nouns would not be translated. With German, all nouns would need to be translated. When working with the software, be sure to go into the global options and find the options for translating capitals. You can turn this option On or Off. In the 18th century a number of writers helped to develop the modern standard German language form that we use today. A corresponding norm for spoken High German, influenced by the written standard, is used in education, the theater, and broadcasting. Dialects that differ substantially from standard German, not only in pronunciation but also in grammar, are found in regions of Germany, E France, Switzerland, and Liechtenstein; Lëtzeburgesch, an official language of Luxembourg, is a German dialect spoken by about 400,000 people there.